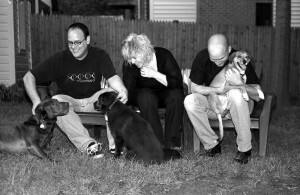 CHANNELS, the band, formed late in 2003 (a mutual love of Siouxsie and the Banshees, Jesus Lizard, and early XTC often cited as a motivating factor) and released a 6-song EP entitled “Open” on DeSoto Records in Fall of 2004. The members of this band played previously in other bands: Kerosene 454, Oswego (Zentek), Shonben (Morgan), Burning Airlines, Jawbox (Robbins). In the 21st Century spirit of apocalypse as a regularly scheduled (and branded) event, CHANNELS have made a 12-song CD entitled “Waiting For The Next End Of The World.” Most of the record was played live in the studio and recorded by the band themselves. Guitarist Robbins mixed it, Alan Douches mastered it, Peter Quinn did the album art, and Dischord Records put it out. In 2014, Arctic Rodeo Recordings released both records on vinyl. “Open” was pressed on vinyl 10″, “Waiting For The Next End Of The World” on vinyl 12″. Both including a free CD.